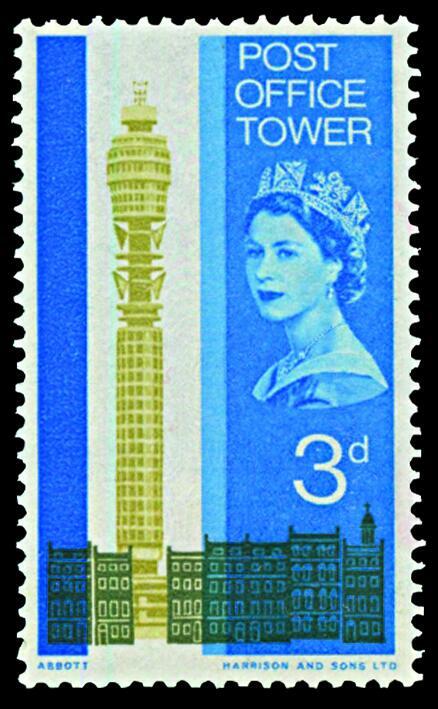 This stamp of the Post Office Tower from 1965 is superb, even if it misses out the Post Office Tower itself due to a printing error (thanks to @stampmagazine for the image). 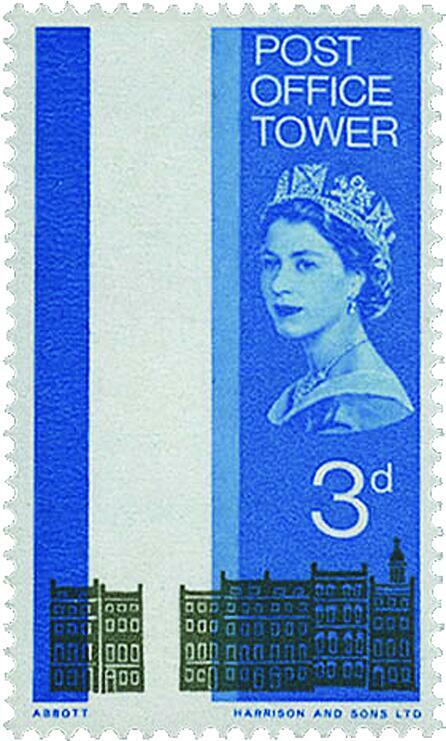 In fact, that seems kind of appropriate as the Post Office Tower was deliberately left off Ordnance Survey maps for decades because it was deemed to be an official secret and therefore of such great military importance nobody was allowed to know where it was even though it had become one of the most recognisable buildings in Britain pretty much as soon as it was opened by Tony Benn (who narrates this brief history of the tower). It even appeared in an episode of Dr Who in 1966. 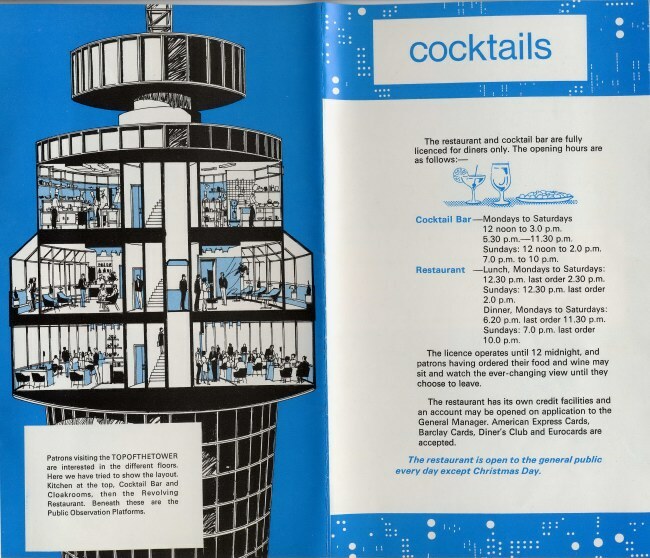 And in 1966, its revolving restaurant featured in one of Look At Life‘s fabulous films. 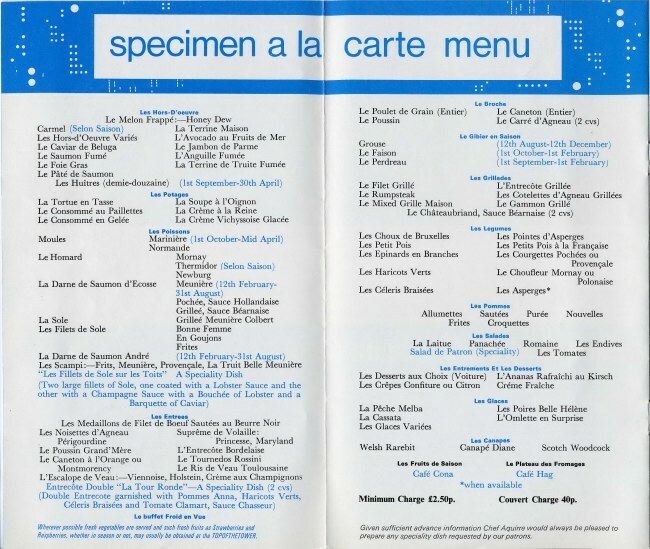 Here are two pages from the menu, taken from the excellent Butlins Memories website. The Post Office Tower was bombed in 1971 (often attributed to Irish nationalists but more likely the work of the Angry Brigade) and even survived an attack by a giant kitten in the 1970s. It’s still very popular. Here’s a film by somebody who collects memorabilia about the tower. 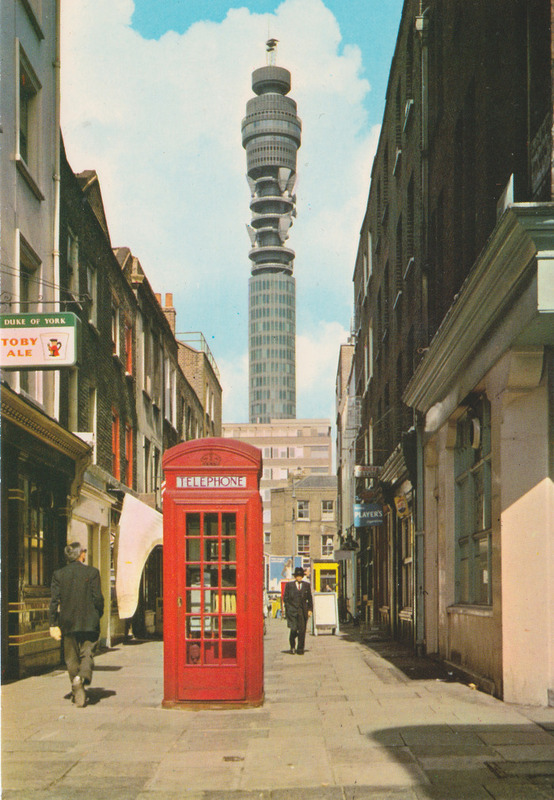 Rob Webb has scanned some pages from the original souvenir brochure on his website and James Ward has a nice selection of postcards featuring the Post Office Tower on his blog. I like this one. This entry was posted in Architecture, Film, History, London, Maps, Photography, Street furniture and tagged Butlins, Dr Who, film, James Ward, Kitten, London, Look At Life, Menu, Ordnance Survey, Post Office Tower, revolving restaurant, stamps, The Goodies, Tony Benn. Bookmark the permalink. Thank you. That is just what I needed. I LOVE the Post office Tower and did a sponsored walk up it a couple of years ago just so I could see inside. Worth every step. What happened to the threats to re-open the restaurant? I’m hanging on in for that. Meet James Ward. He claims to like boring things, but actually a lot of his stuff is pretty interesting. Don’t tell him I said that. DOH! GODDAMMIT I didn’t see until after I’d posted that comment that my cleverness in knowing someone else who’d blogged the tower was already name checked. My apologies.